After Richard Nixon had disgraced himself by lying to the country and eventually resigning as President, he retired to his California beachside mansion to play golf. Years later, swanky British TV journalist, Robert Frost sought Nixon for an exclusive one-on-one interview. Frost’s road wasn’t easy, but after forking over nearly 2 million of his own money, he got the sit-down he wanted. 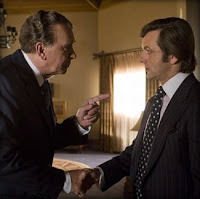 Ron Howard’s Frost/Nixon is the most enthralling piece of cinema this year. At two hours long, you’ll be gripping the armrest in excitement. Peter Morgan (writer of The Queen) adapts his play using the same actors, a rare feat from a stage to screen adaptation. Frank Langella, who won the Tony Award for playing Nixon on stage, is better than you may have heard. He doesn’t impersonate Nixon, he embodies him. You’ve seen Langella in Good Night and Good Luck and Superman Returns among other supporting turns, but as Nixon, he delivers a career best. He’ll get nominated for the Oscar, giving Sean Penn and Mickey Rourke some tough competition. While Langella is a triumph, the real star of the film is Michael Sheen, who plays Frost. The trials and tribulations of Frost’s journey are at the center of the film. He played Tony Blair in The Queen, but we’ve never seen him do anything with this much spark. Frost is helped by a few scholars to investigate Nixon, who are played with great comedic wit by Sam Rockwell, Matthew Macfadyen and Oliver Platt. The three take the project more seriously than Frost, which is strange given how much Frost has on the table. The interview scenes are pulse-pounding, even though they were pretty boring in real life. Howard keeps the same exact dialogue of the original interviews in tact, but by having the film told from Frost’s perspective, we sympathize with his unpreparedness. Guided by a superb Kevin Bacon, Nixon coolly drags on answers and avoids key topics as Frost begins to realize that he’s in over his head. The best scene of the film is one of the few that is completely fictionalized, when Nixon drunkenly calls Frost the night before their final interview. The ten minute phone conversation that will have you on the edge of your seat. Watch Langella, slightly off camera, yelling into the phone. He isn’t yelling at Frost, he’s yelling for both of them. It’s powerful filmmaking. Principled making my earliest send at withrowag.blogspot.com, which seems to be a wonderful forum!